High performance, highly reliable and secure NVMe M.2 solid state drive designed for servers that need enhanced data reliability to safeguard critical data! 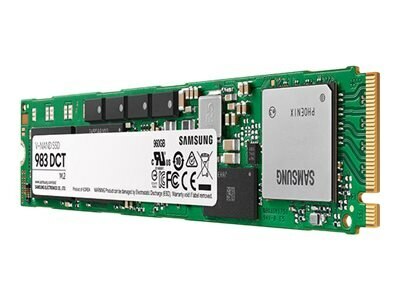 Samsung's 960GB 983 DCT NVMe M.2 2210 Enterprise Solid State Drive is a high-performance solution for servers that need enhanced data reliability to safeguard critical data, from content delivery networks (CDNs) to big data, artificial intelligence (AI) and Internet of Things (IoT) applications. The 983 DCT’s NVMe interface empowers blazing-fast speed, high responsiveness and a high Quality of Service (QoS). And with power-loss protection and end-to-end data protection via AES 256-bit Encryption, you get a highly reliable enterprise storage solution.